Pets, and cats in particular, ask so little from us. Food, a litter box, a roof, a warm radiator or basket of laundry, perhaps a stuffed mouse or two. In return we receive their lifetime of affection and companionship without judgment or question. In the end there is one last thing they need, but can not ask for, nor would they if they could. It is difficult, but it is our duty. I’ve always been a cat person. 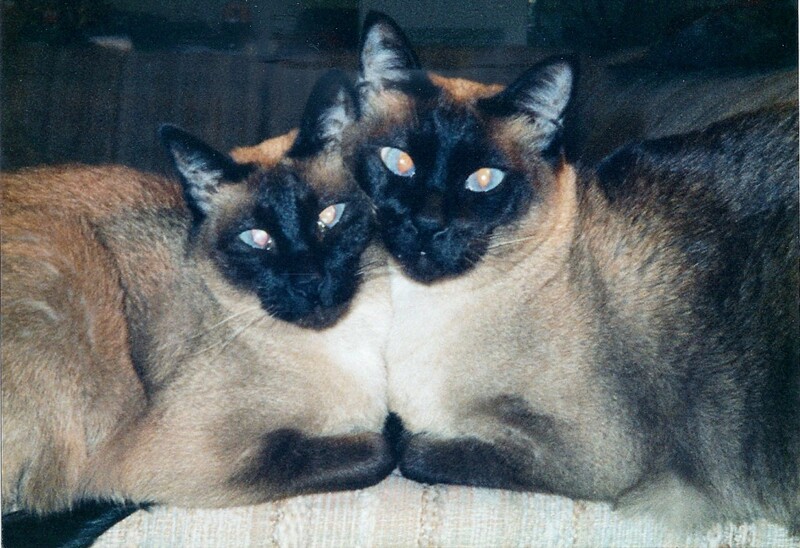 From birth my parents always had a pair of Siamese cats, often we had three cats at a time but there was always a pair of Siamese. That pair were always a male named Nani and a female named Nekko. Typically they were litter mates or from the same parent and close in age. I vividly remember going to pick out the pair of kittens that were a major part of my life, from childhood in the early 80’s into my adulthood when they died one week apart, almost 19 years later. 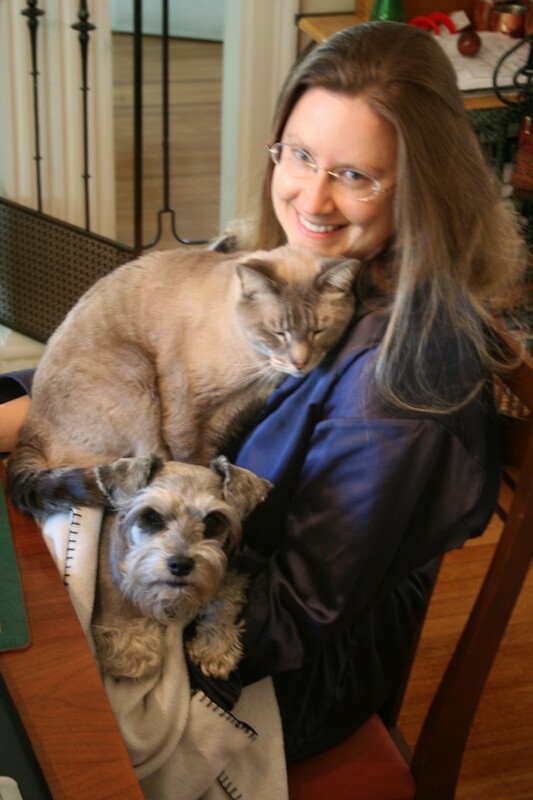 I had long since moved out and gotten married and started a fur family of my own when the very sad news of their passing came. I regret not being able to say goodbye to them, but I am filled with many wonderful memories of them and keep them close to my heart. Every time I lose a pet, it’s like losing a part of myself. It’s a reminder that life changes and when you lose someone who’s been such a major part of your life, animal or human, it reminds you how fragile and beautiful life is. 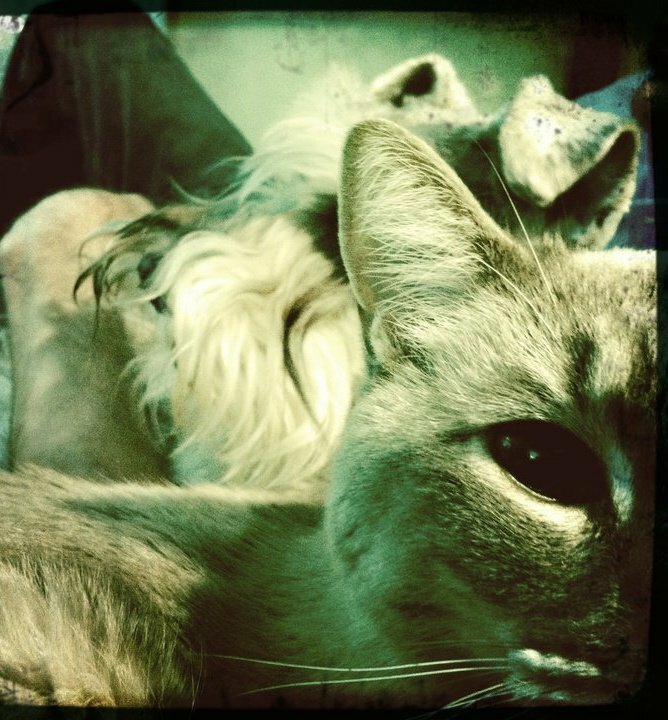 My pets are a very big part of what I define as my family. Cats and dogs love you unconditionally, they make no judgment and they are with you through the highs and lows of your life. They are there for you when boyfriends or lovers break your heart and when you lose a family member. You don’t relate to them the way you do with other humans, it’s a completely different relationship; not comparable. At times they seem to be the only stable part of your life, that is until they become ill, or worse. 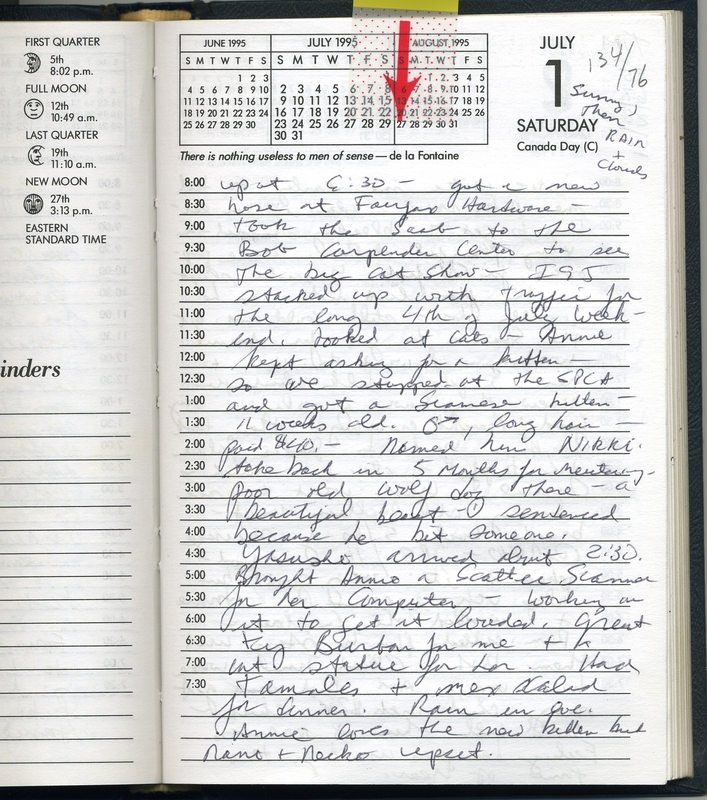 My father says on Sunday, September 19, 1982 that I told him I had been wishing on my moonflower the night before for a kitty. That morning in the paper my mother saw an ad for a Siamese Lilac Point male kitten, six weeks old for $50. I came home with the little guy later that day. We had a Nani at the time, he was not too eager to meet Nicky. I was in love. He spent lots of time outside in our wooded backyard where we would often play together. I was at work the day my mother took Nicky into the vet because he had become lethargic. She came in to the drugstore I was working in later that day to let me know that she’d had to have Nicky euthanized. My heart sank. I was overcome with sadness and struggled through the rest of my day. 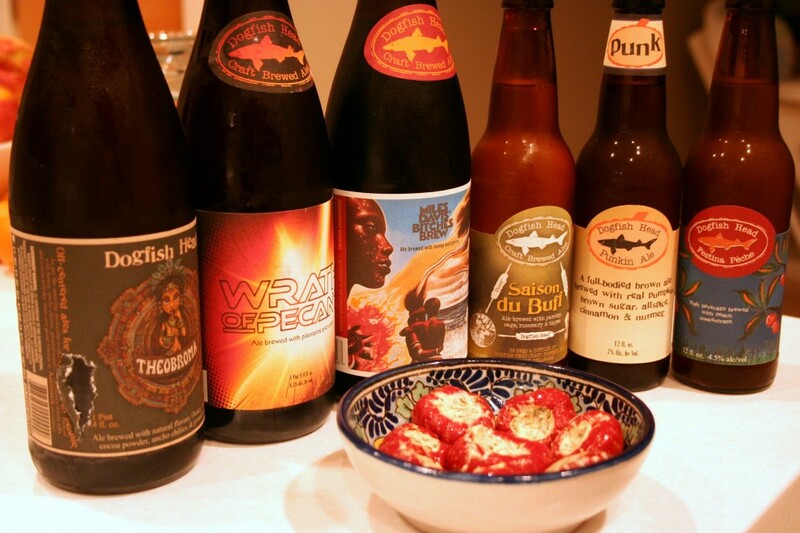 On July 1, 1995 I was living at home and going to the University of Delaware. There was a cat show at the Bob Carpenter Center this day and I begged my father to go with me. All the way there in the car I asked for a kitten. 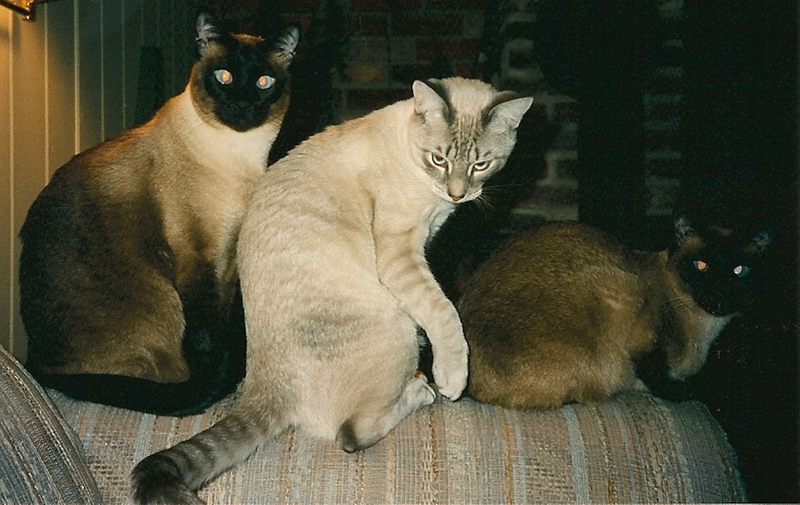 I had become smitten with the idea of finding some exotic breed of cat, a Devon or Cornish Rex or perhaps another Siamese as that was the breed I was most familiar with. I’m sure I kept pestering Dad the entire time we were at the cat show. He gave in, but not there, not at the cat show. Instead he drove me to the local SPCA and there I saw him. 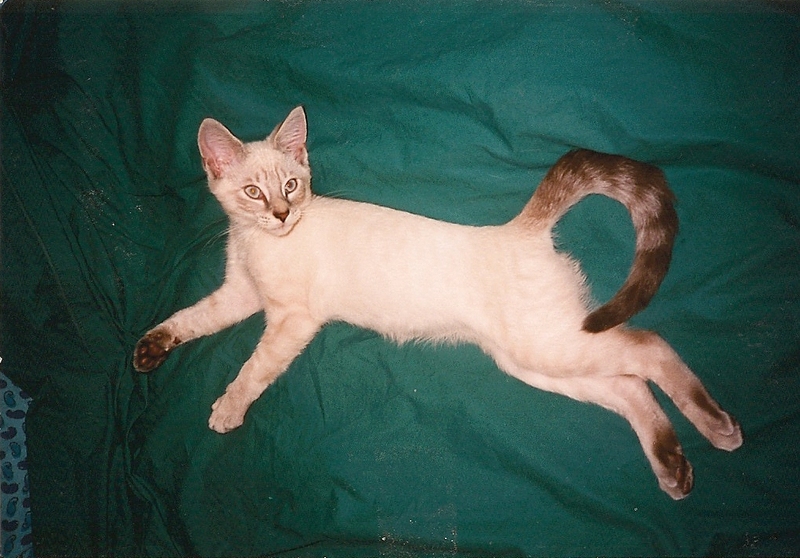 He was about 11 weeks old, mostly white but with markings that indicated he was part Siamese. We asked why he was in the shelter and they told us his previous owners brought him in because he was “too energetic.” Imagine that, a kitten who was too energetic?! I took him home immediately, in those days you could do that, and in keeping with my parents tradition I named him Nikki. I chose I slightly different spelling, Nikademous, for his full name. I fell deeply in love with him. And yes, he was full of energy and he was perfect. Nikki was not immediately appreciated by Nani and Nekko but soon the three of them formed quite a bond. 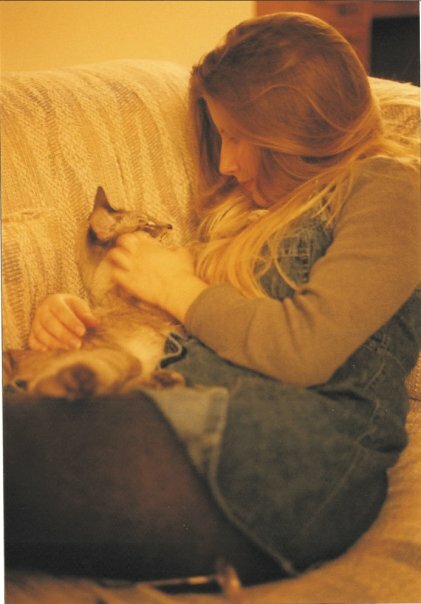 When my parents moved to West Virginia for my dad’s job in 1997, Nikki moved into an apartment with me. 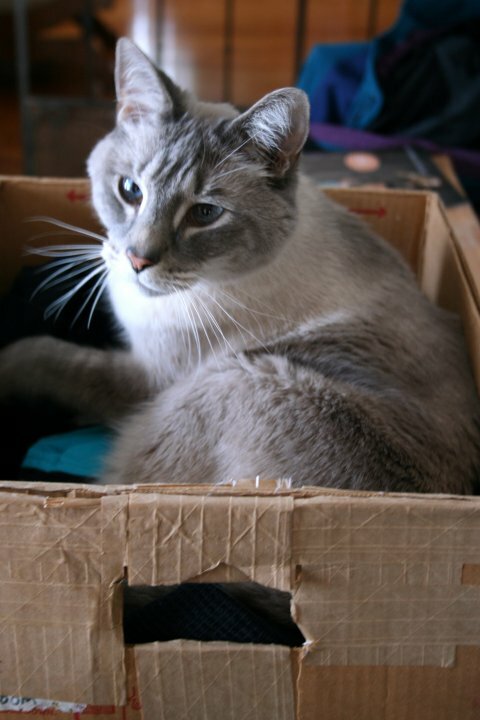 He always was a fun companion, made his presence known and often chatted with me, surely his Siamese roots at work. He was quite boisterous when he was hungry and would not be ignored. I’d try to catch a few more winks in the mornings by putting him out of my room (he slept in my bed each night) and closing the door. He would somersault against my bedroom door until I couldn’t stand it anymore and I would get up to feed him. Then after being sated he would curl up in one of his favorite nesting places and sleep happily. He continued this behavior for the rest of his life. Nikki did well living on his own with me and he also did really well with our other pets. 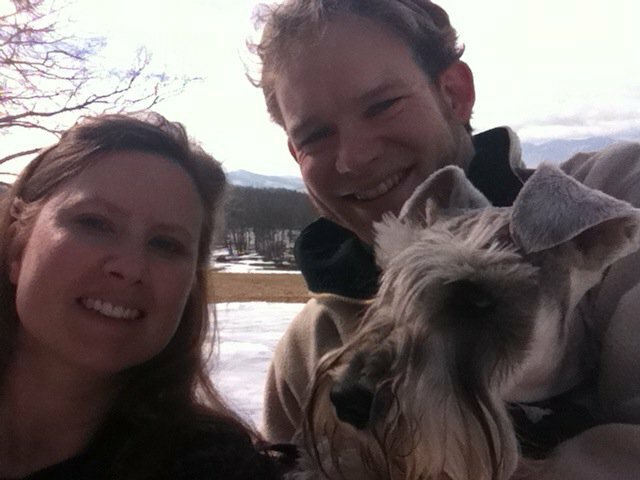 When I moved to Blacksburg, Virginia in 1998 with my new husband to start graduate school, of course Nikki moved with us. 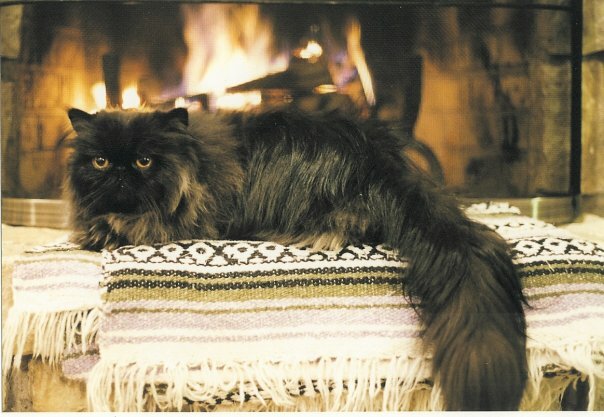 A few months later we adopted (rescued) a Smokey Persian cat, named Dakota. He and Nikki were only months apart in age and they quickly became bosom buddies. 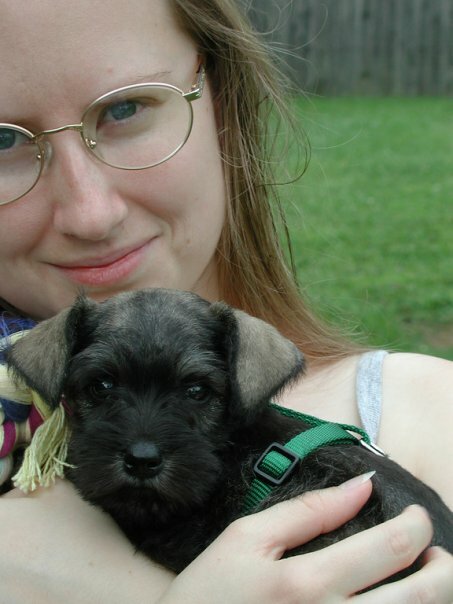 Later on in 2000, we brought home a miniature schnauzer puppy, Saabina. Saabina was my first dog and Nikki took to her like a big brother. Dakota, tolerated her but only so much. 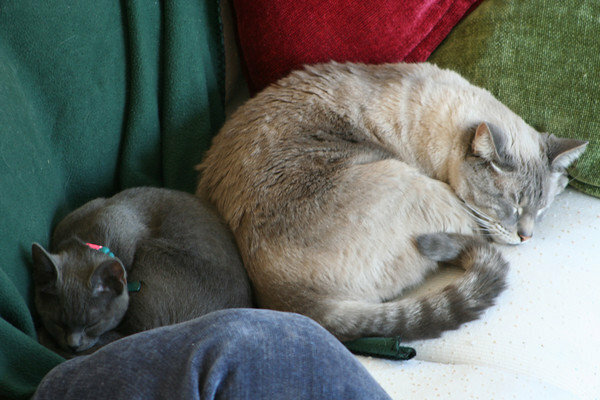 Nikki and Saabina were often cuddling and playing together. In 2002, when I graduated with my master’s in landscape architecture, my husband’s job left him and so we were both looking for work. Although we wanted very much to stay in Virginia, there were no jobs to be had. My husband was offered a job back in our home town of Wilmington, DE so we reluctantly moved back to Delaware. We had trouble finding a house and decided to settle on having a house built in a new community, an idea we were less than thrilled about. During the months we waited for construction to start we lived with my husband’s 93 year old grandmother in her tiny ranch house in Dover. 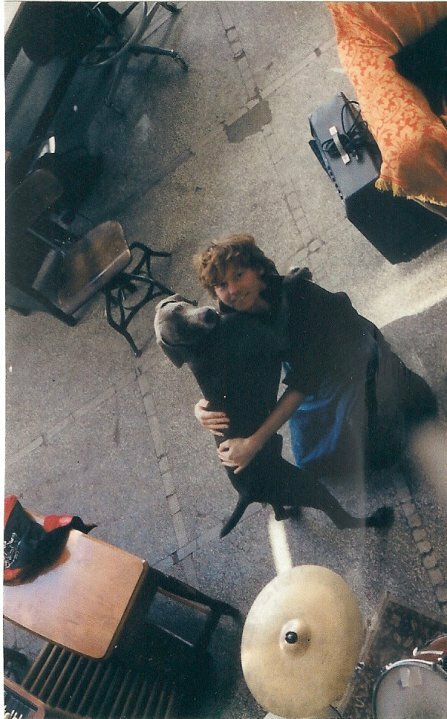 We were only allowed to bring our dog, Saabina with us so Nikki and Dakota stayed in West Virginia with my parents for that time. We hated being separated from our cats. Once it became clear that our house was not going to be built anytime soon we decided to look for a house in Wilmington again. After a rigorous search we found the lovely old house we’re in now. 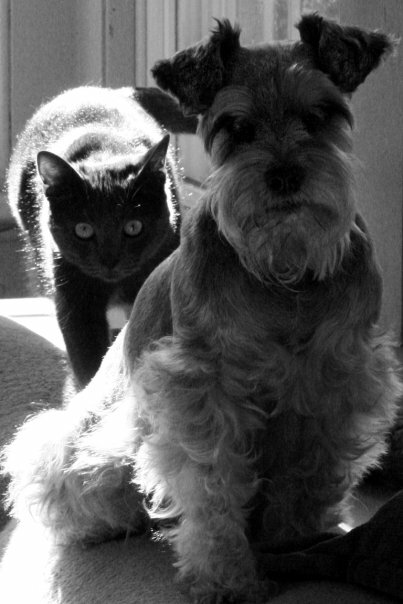 In June 2003, we all moved in and our furry family was back together again. 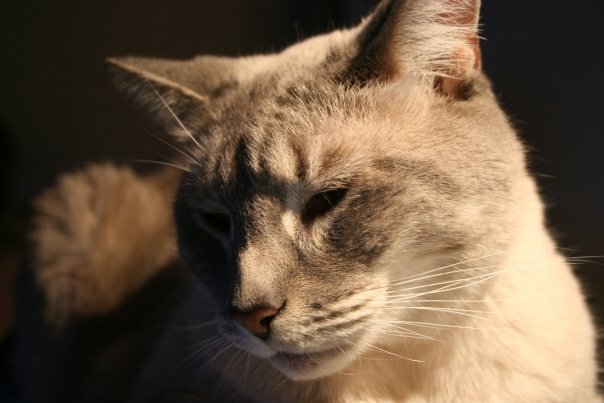 In September 2004, at nine years old, Dakota became very sick and my husband and I had to make the very difficult decision together to have him euthanized. 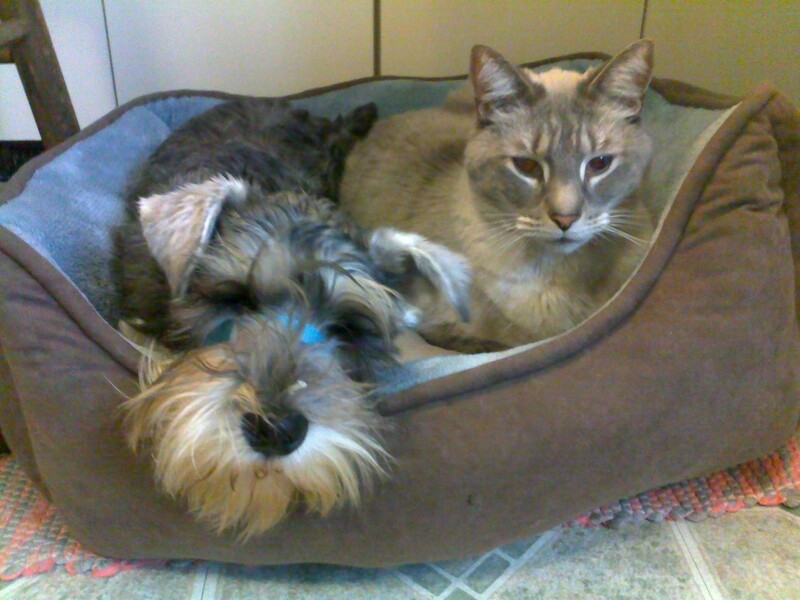 Dakota had congested heart failure and we couldn’t let him suffer. Together in the vets office we held him while he breathed his last breath and we took him home. 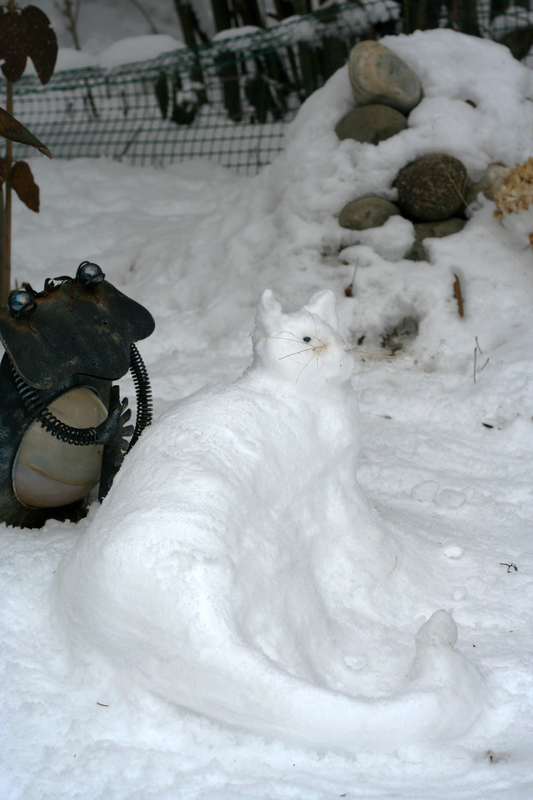 We buried Dakota, who had always been an indoor cat, along with some photos and a few words about him on a card in our garden amongst the hellebores and ferns under the white birch tree. 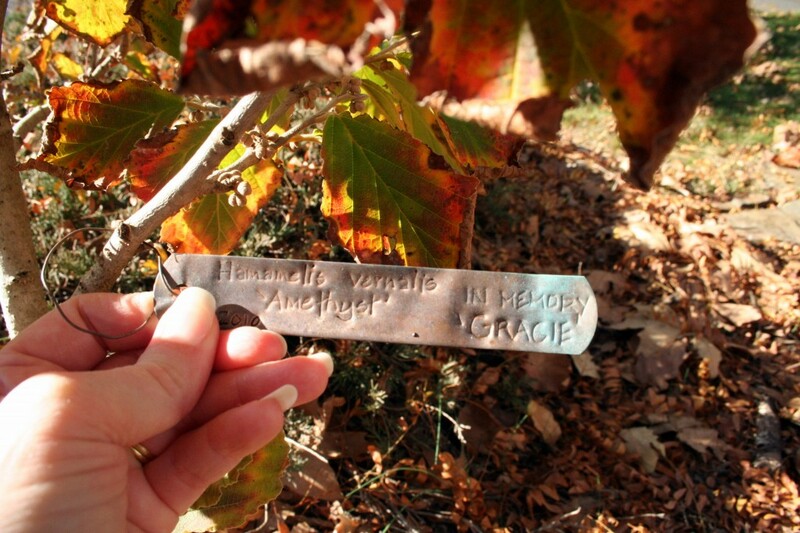 We placed a playful, copper birdbath as his grave marker. It was the first time my husband and I would go through this experience together. In late November, 2006 we went to the local cat shelter and fell in love with a tiny gray kitten who had been left behind. The shelter had just had a cat event and all the kittens were adopted, except for “Puff”. Puff had been found under a car in Philadelphia. She purred constantly and drooled when she nuzzled and we knew she would be going home with us. 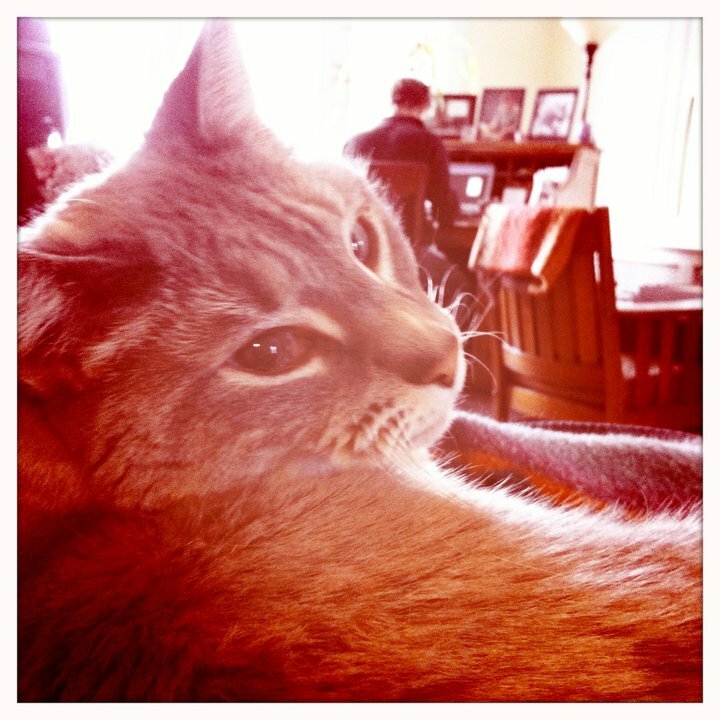 On December 1, 2006 we brought her home and named her Kikimora, “Kiki” for short. Naturally, she and Nikki became best pals and Saabina too really took a liking to her. We referred to her as Saabina’s kitty. The two often played together and Kiki was always giving her headbutts. On December 17, 2009 Saabina was fatally bitten by a dog while out on her afternoon walk with my father-in-law. We were devastated. Nikki and Kiki were our rocks. 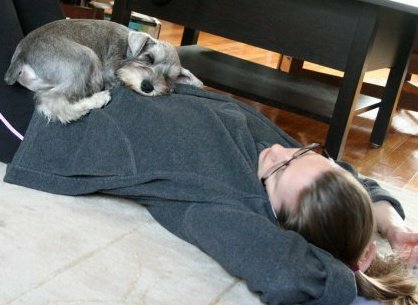 Two weeks later, on December 31, 2009, heartbroken over the loss of our canine companion we brought home a 3.5 month old pup and welcomed him into our feline home. Stefanwolf (“Wolfie”) and Nikki became fast friends. Kiki took a while to warm up to Wolfie. Nikki and Wolfie would often curl up together in Wolfie’s bed or on the couch. 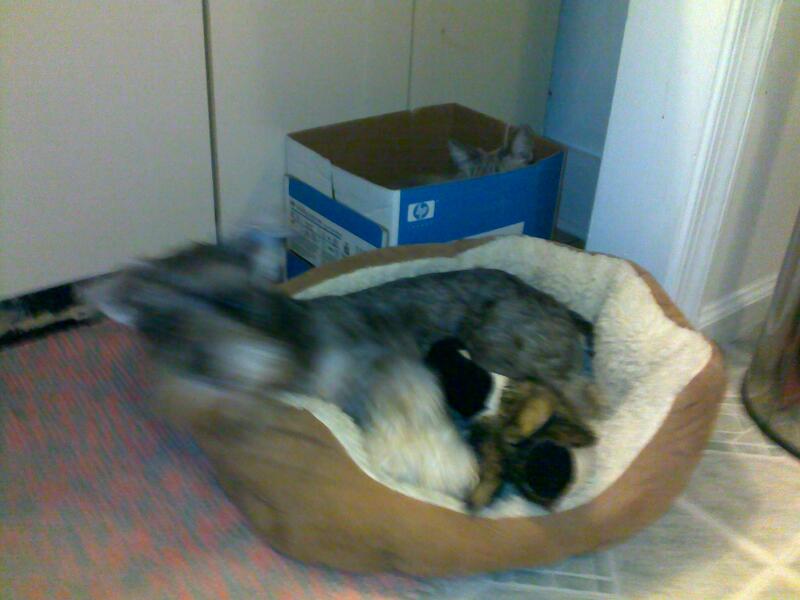 I occasionally found Nikki lying almost on top of Wolfie. I credit some of Wolfie’s feline mannerisms to Nikki. A few days ago, January 26, 2011 to be exact, I had to make that heart-wrenching decision that every pet owner realizes someday they may be faced with. When you adopt an animal you aren’t thinking about the hard truth that someday this beautiful creature that you have bonded with will die. The circumstances may be out of your control or it may be left to you to know when the time has come. This week was the second time my husband and I were faced with that decision. Up until last March when our vet diagnosed him with hyperthyroidism, Nikki was very healthy and happy. Our vet said he may do well on medication and estimated he could have another 1-3 years of good life. I guess we were really hoping for the three years, but we didn’t quite make it to the one year mark. On Monday night he became very sick and would not eat at all on Tuesday. My husband and I woke up Wednesday morning and found Nikki searching for solace in Wolfie’s crate in our bedroom. He wouldn’t come out, he wouldn’t eat, he wasn’t happy and neither were we. It was snowing and we took him to a nearby vet without an appointment. After blood tests revealed his kidneys were failing and learning that it was going to take some pretty heroic measures to get him back on track, we decided it was time. He’d lived a wonderful life with us. He was there for us through some amazing good and bad times. We stayed with him and just like with Dakota, we didn’t let go of him until he let out his last breath. I tucked him into a pillow case I had made many years ago and hugged him to me as we drove home in the snow. Stefan dug a hole under the viburnum shrubs, next to Saabina’s grave in our garden and we laid our sweet boy to rest. That day it continued to snow and we both went to work with heavy hearts and came home feeling lost. That night it rained, the rain turned to sleet and then it started to thunder and lightening. Then the snow came again and when we woke up we had about a foot of snow. Yesterday I made a snow sculpture on top of Nikki’s grave, a tribute to my tiger in the snow and today I’m sitting here writing this missing my baby. I keep finding his white hairs everywhere and I keep thinking I see him. I know I’ll never stop missing him, but he’ll always be with me in my heart and he’s out there in my garden forever. I miss you old boy, there’s a piece of my heart missing now. Someday when I’m ready I will gladly open my heart to a new feline furiend meanwhile Kiki, Wolfie, Stefan and I will forever remember you fondly. 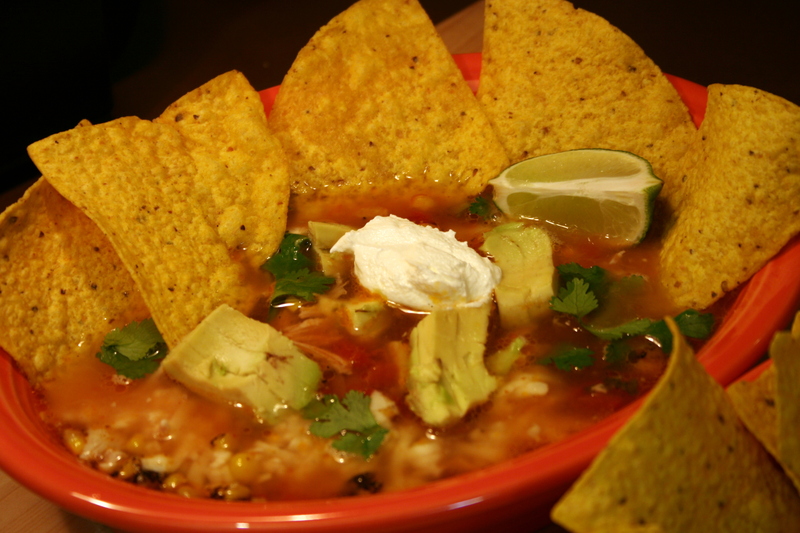 This is one of my favorite soups, so full of flavor and you can add whatever garnishes you prefer to add even more depth. 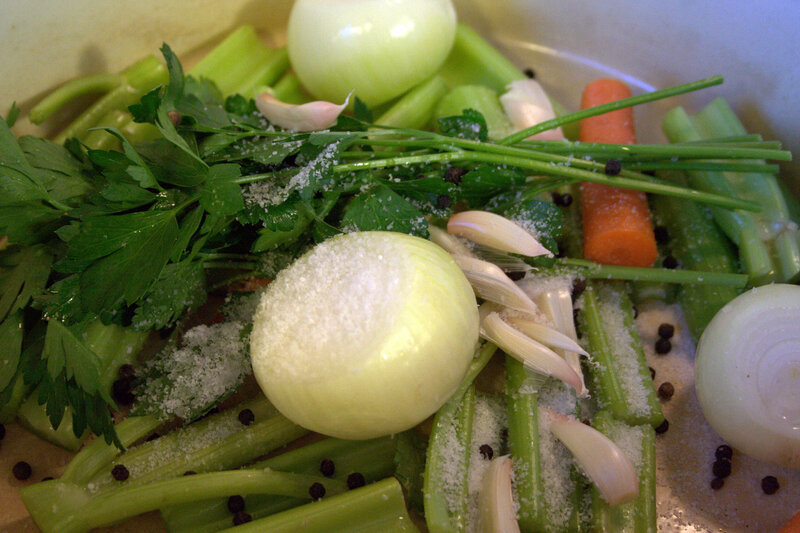 I prefer to start by making my own chicken stock but you can also use a good quality stock. You will need about 6 cups of stock. Roughly chop the vegetables and add to large dutch oven or heavy stock pot. Add whole chicken and season with kosher salt, peppercorns and fresh parsley. Add enough water to completely cover chicken. Bring to a boil and simmer for about 1 hour or until the chicken is done. Remove chicken and pick the chicken meat off the bones and reserve meat for the soup. Strain vegetables and peppercorns from stock, add chicken meat back to the stock. Saute onion and garlic in oil a few minutes and then add peppers and saute along with the chili powder, cumin, cayenne, etc. Then add this mixture to the pot with chicken meat and stock and simmer 1/2 hour. Add tomatoes and salsa after it has been simmering about 15 min. After it simmers for another half hour then add beans and corn along with tomato paste and crushed tortillas. Continue to cook until its heated and as thick as you like it. Remember when you add shredded cheese that it will thicken it more. This has become a favorite weekend breakfast in our house. This is not my recipe but one I came across online. I love pancakes but this one is wonderful especially for guests and on days when you don’t feel like making a batch of pancakes one by one. 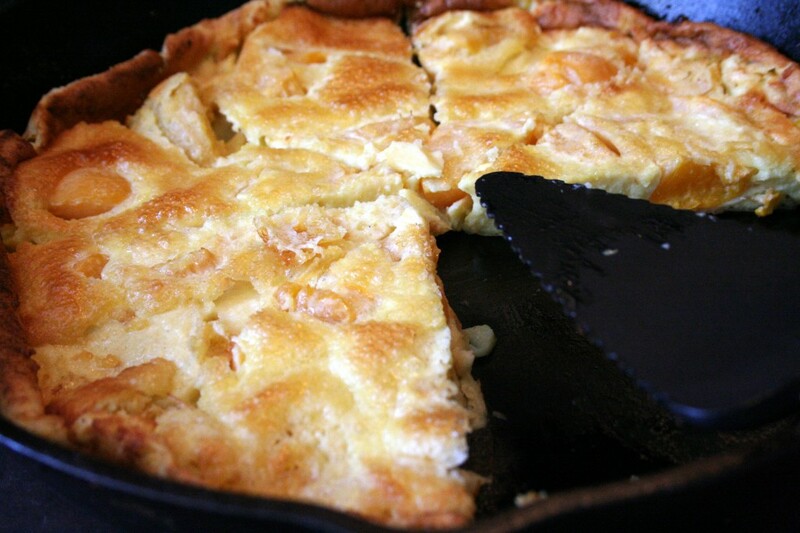 Mix Flour, milk, eggs, salt and nutmeg together. Fold in peaches. Put butter in a 12-inch iron skillet and put in 450 degree oven. Watch very carefully and in approximately 5-8 minutes the butter should be melted and beginning to bubble. Do not burn. Add batter. Bake 15 minutes. I’ve been inspired by my good friend Suzy to write you a letter, but I’ll never mail it and I’ll never truly know if you get it but that’s okay, at least I tried. I can’t believe it will be eight years this January 12 since we lost you. Some days it seems like just yesterday. We never talked about the possibility of you losing this battle. I never dreamed I’d be growing older without you there in Minnesota tottering around in your studio sending me postcards, mix tapes and calling me to chat about what crazy thing Dad’s been up to. Ironic that Cancer, the sign you wore born under, was also the one that took you away from us. Do you realize how much I miss you? There’s not a day I don’t think of you, and smile. There’s so much that has happened since you’ve been gone and I thought I would share some of what’s been going on in my life, your little sister. I just turned 36, I’ve now lived longer, than you, though not by much. It’s funny but to me you always seemed both so young while at the same time like such an old soul. Like you’d played this game before. Did you know your mother and Andy adopted a young girl from Kazakhstan shortly after your death? At first I found the idea appalling, a way to close the book on the story of your life, to move on. Now I see it as a very positive thing that they did, they have found new love and they are all benefiting from it. I’ve tried to connect with your adopted sister but she’s not interested in me, at least not right now, at age 15. Perhaps someday we will, perhaps not. I want you to know our dad is doing fine now, I was so worried about him for such a long time. He spiraled into depression and seemed to be lost in his sorrow. I understood, as I was also grieving your loss and we were both lost. I can say that now, eight years later, we’ve both changed but we’re happier now. We can share stories and memories and keep you alive in our hearts. Your death taught me a lot. It has certainly made me appreciate life so much more and to focus on the family and friends I have who are dear to me. I am not afraid to share my feelings and let them know how much they mean to me. I am trying to live in the moment more and be more happy, laugh more and spend more time doing the things in life that make me happy. 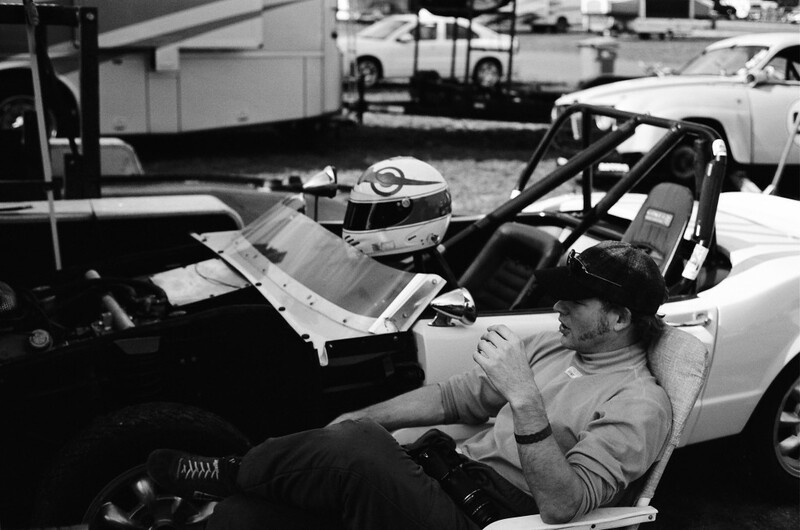 I wish you could see Stefan and what an incredible vintage racecar driver he’s become. You’d be impressed, I’m so proud of his accomplishments. Stefan has been taking good care of your BMW /5 and Lambretta scooter, they both need a little TLC and he promises to fix them up again soon so that we can go for some rides. 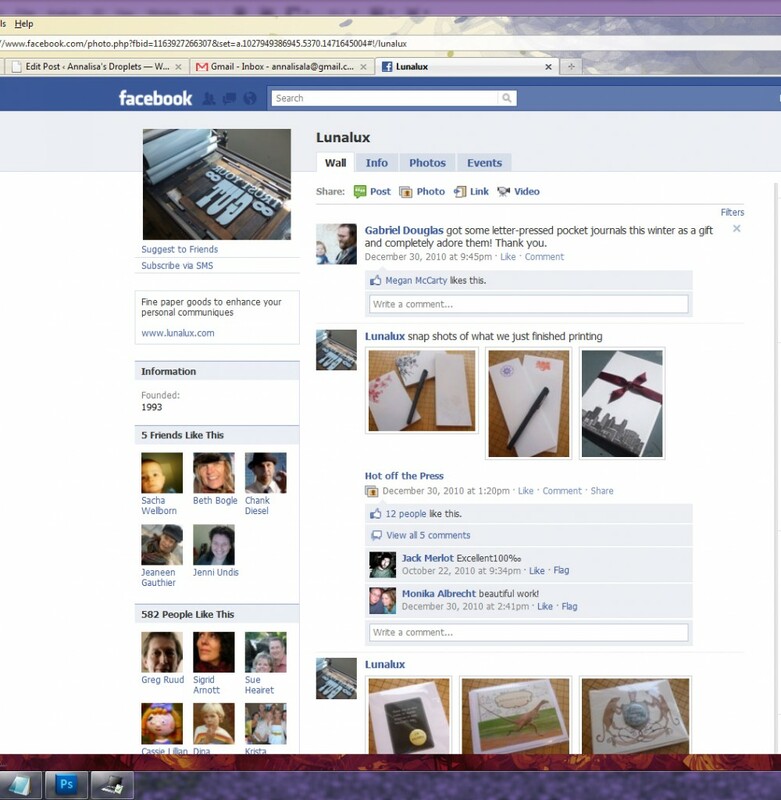 Did you know there is this social networking site called Facebook? It’s amazing, in both a good and bad sense. You won’t believe this but it’s allowed me to find and stay somewhat connected with not only my friends and family but some of your friends. I think you’d have definitely had an account before me and would have way more many friends but it’s been a way for me to learn more about you and share your memories from time to time. Your studio, Lunalux, continues to do well. I know this because I’m “friends” with Jenni on Facebook and she created a Lunalux Facebook fan page. How cool is that? Here’s something else you may not know, Sacha now has three beautiful sons and he and Rachel seem to be doing quite well in England. I’ve even connected with your good pals John and Candace from Walt Mink. I’ve shared old photos and some of your art with these wonderful, old pals of yours through this site. It’s fun to read their comments and know that there are other people out there who remember you, because the memories are all I have now. Remember that New Year’s eve trip to North Carolina we made, Stefan, Saabina and I following you, Beth and Simon to your mother and Andy’s rustic old cabin? 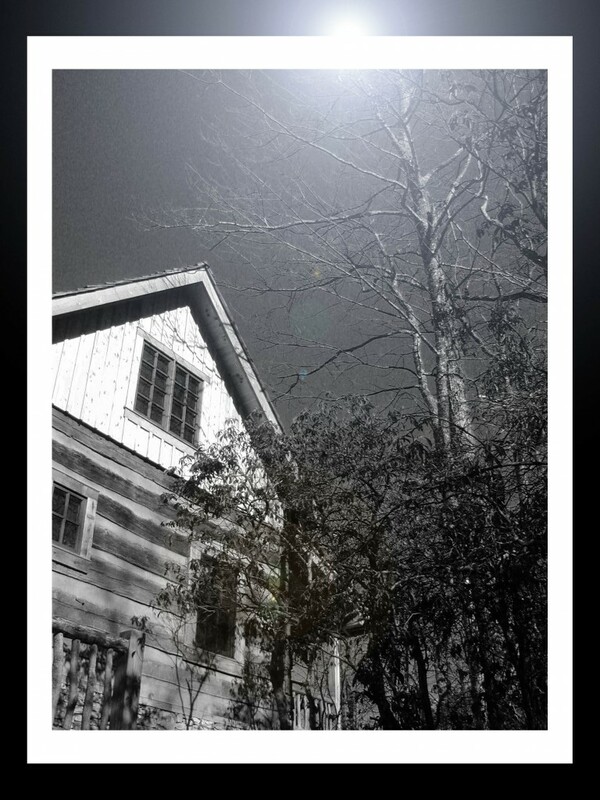 That snowy evening where you made us stop at the Waffle House that late night to fill up on waffles, bacon and other yummies because once we got to the cabin we’d be eating your Mom’s macrobiotic diet? That was so much fun and you seemed so happy and alive at that time. Well, much has happened. Simon and Saabina have both passed on and that cabin has been added onto. Your mother had an architect build a more contemporary style house completely around it, the cabin is more of a museum inside the house. I kind of like it. It’s given it a new life which I think it needed. Oh, and they put in this amazing pizza oven. You would love it! Did you know, I got a puppy last year? 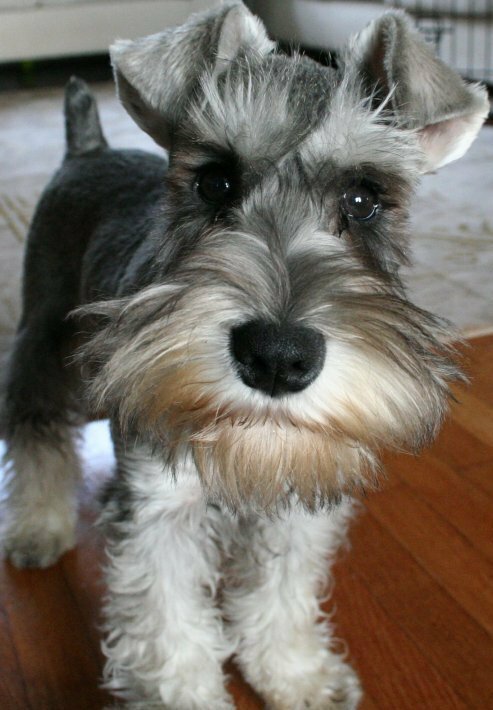 Another miniature schnauzer, like Saabina? Only this one is the most handsome boy. We named him Stefanwolf, Wolfie for short. I’ll tell you a secret, I made him a facebook page, yes there is an entire animal underworld on facebook. Well, Wolfie is way more popular than I’ll ever be. He brings joy, I hope, and a lot of silliness to the lives of others. It’s really weird and silly, I know, but it’s harmless fun and there should be more of that in this world. I think you should also know that I’ve become quite a good cook. 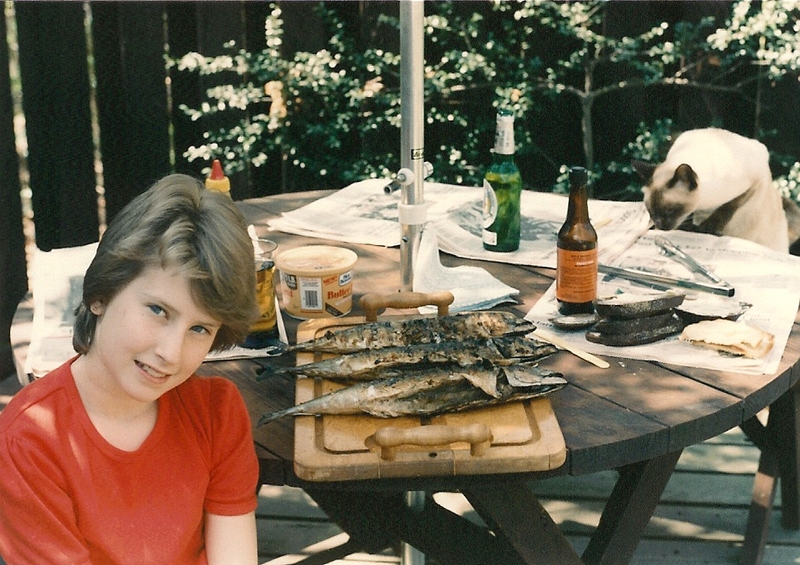 We were both raised to eat all kinds of foods and as adults shared an interest in cooking and food in general. Well, it’s really become a passion of mine. Why just this weekend I spent most of my time cooking my homemade chicken soup, an amazing chili and a roast of venison that I think you would have enjoyed. Dad is always complementing me on my cooking which makes me think you would be proud of me too. You know what I really miss? 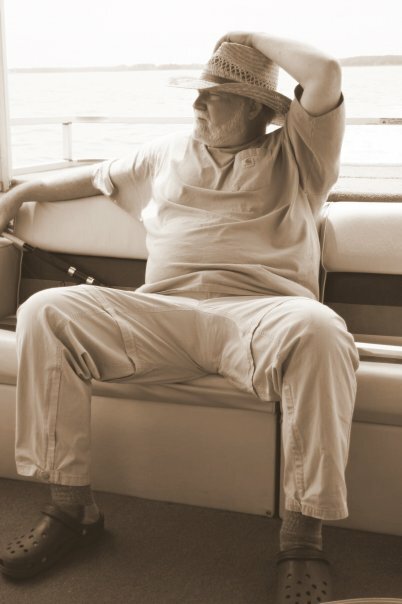 The sound of your voice, the countless ways you entertained me with your quirky behavior, your amazing sense of humor and your incredible artistic eye. I think of you whenever I hear Mazzy Star, Tom Waits, A Prairie Home Companion, see a BMW /5, Lambretta or Vespa and did you know I am typing this on my laptop while sitting at your old rolltop desk? 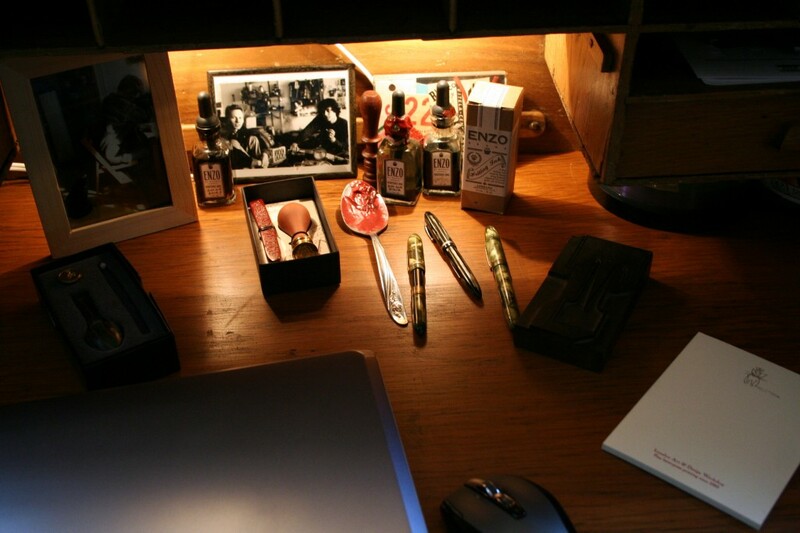 The drawers and cubbies of this fantastic desk are filled with your old pens and inks, cards, stationary, labels, stickers and some of your old pipes and lighters. I cherish all this stuff of yours. Anyway, I just want you to know, eight years later I still miss you incredibly but I am doing fine, everybody’s doing fine, mostly. So, the question was, what meal could we make and use as many of these ingredients in it? We turned to my husband’s IPhone Epicurious app for this challenge. We found this recipe and luckily we had already made duck confit weeks ago and it was all set! 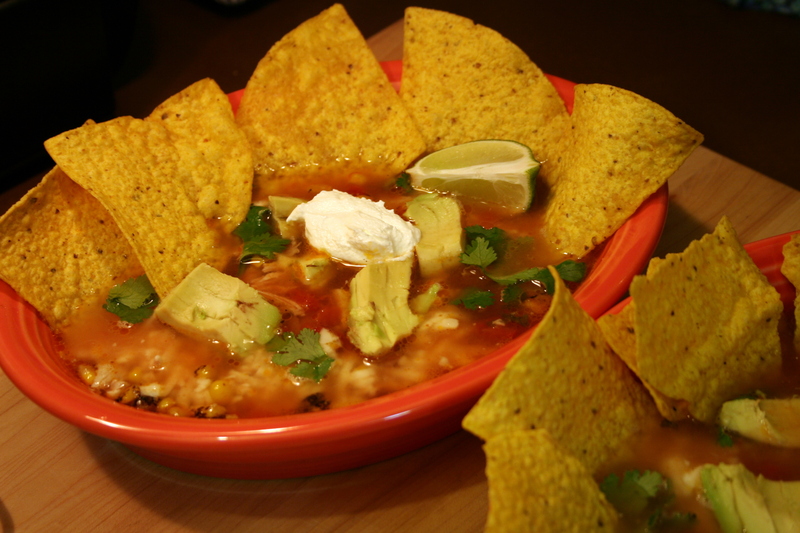 We were excited to try this recipe and were quite pleased with the outcome. Make slaw: Pulse cabbage, in batches if necessary, in a food processor until finely chopped, then transfer to a bowl and add 3/4 teaspoon salt and liquid from pickled beets. Finely chop beets (with a knife) and stir into cabbage mixture along with vinegar. Let stand, stirring occasionally, 30 minutes to allow flavors to develop. 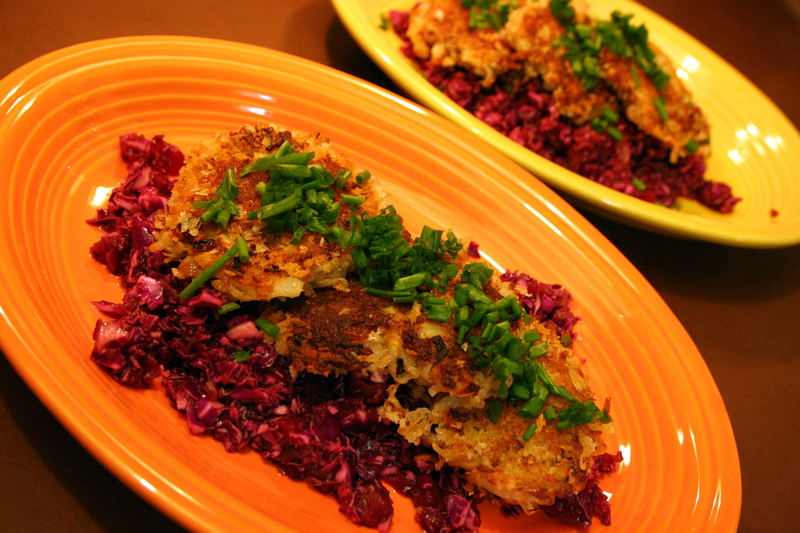 Make pancakes while slaw stands: Remove skin and fat from duck leg and finely chop them (reserve meat), then cook in a 10-inch heavy skillet over moderately low heat, stirring occasionally, until fat is rendered and skin is golden and crisp, about 10 minutes. 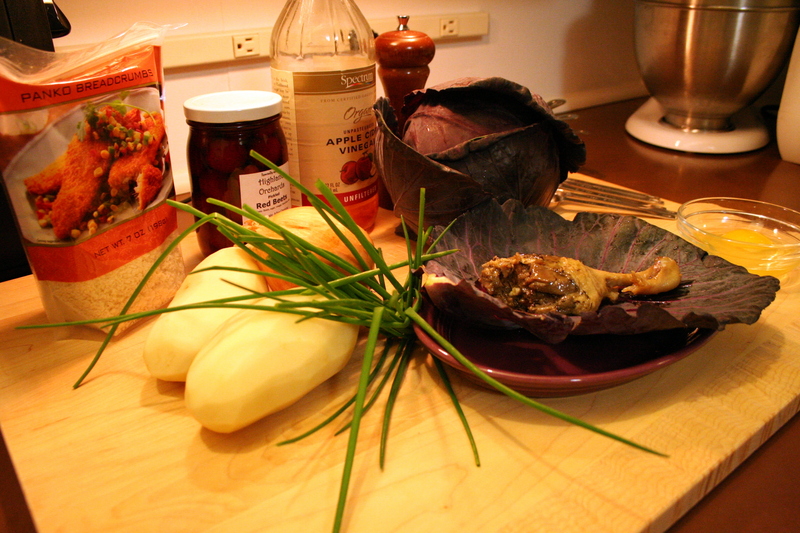 Transfer duck skin with a slotted spoon to paper towels to drain, reserving fat in skillet. 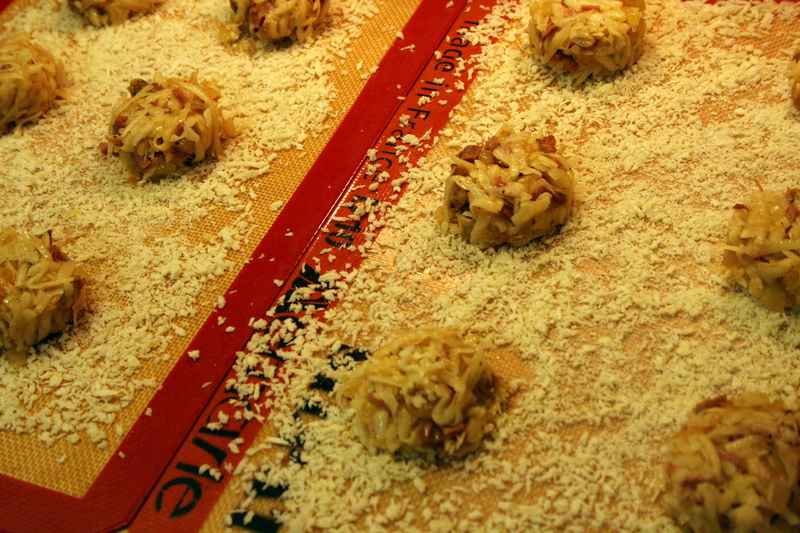 Meanwhile, remove duck meat from bone, discarding bone, and cut into 1/4-inch dice. Add onion to skillet and cook over moderate heat, stirring occasionally, until browned, 7 to 9 minutes. Combine onion, duck meat, and reserved skin in a large bowl. Peel potatoes and shred using large holes of a box grater. Squeeze potatoes by handfuls to eliminate excess moisture, then add to duck mixture along with egg, pepper, and remaining 3/4 teaspoon salt, stirring until combined. Spread 1/2 cup bread crumbs on a sheet of wax paper (I used silpats). Using a scant 1/4 cup potato mixture for each pancake, make 12 mounds on crumbs. 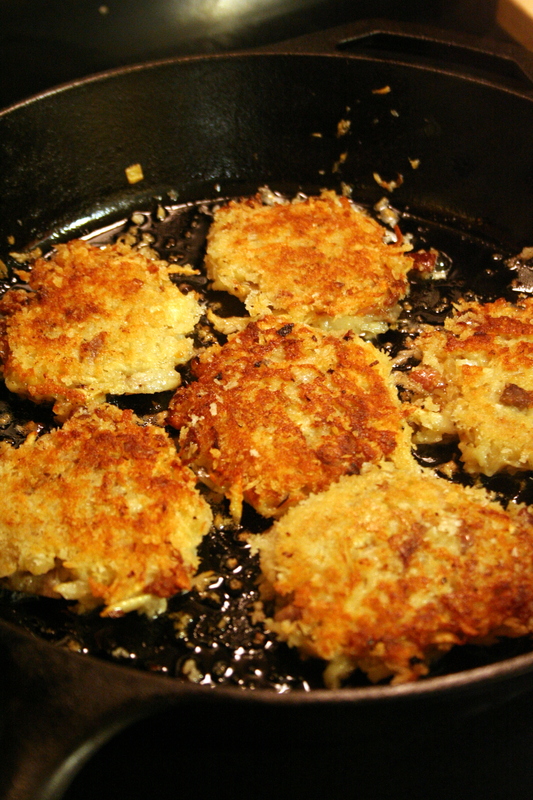 Coat mounds with remaining 1/2 cup crumbs and flatten into 3-inch patties. Heat oil in a 12-inch heavy skillet over moderate heat until hot but not smoking. 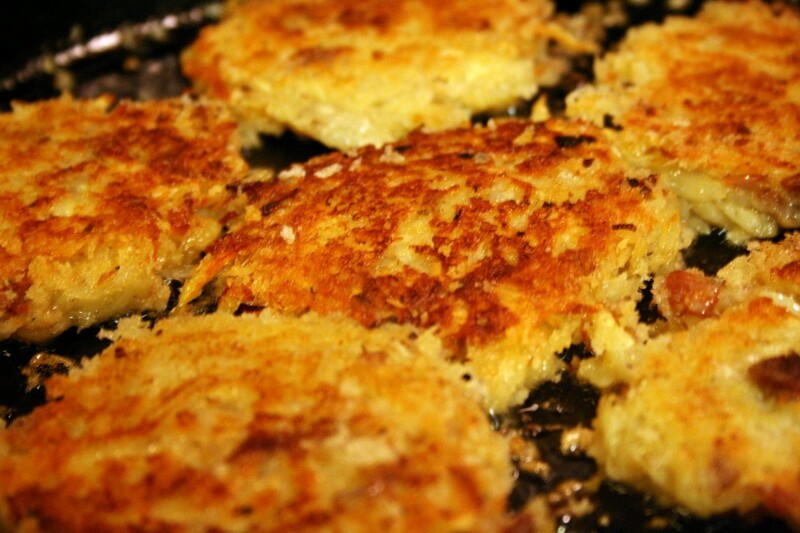 Using a slotted spatula, gently shake off excess crumbs from each potato pancake, then fry in 2 batches, turning over once, until golden, about 6 minutes per batch. Transfer to paper towels to drain. Serve immediately, with slaw. We no longer buy beef since we have a steady supply of venison coming in from my parents. They aren’t hunters and neither are we, but they have friends who hunt but don’t like to eat what they catch. So, it works out nicely for us all. I realize some people have an issue eating Bambi, or meat for that matter. So, if that’s the case use your favorite ground meat or veggies in place of the ground venison. 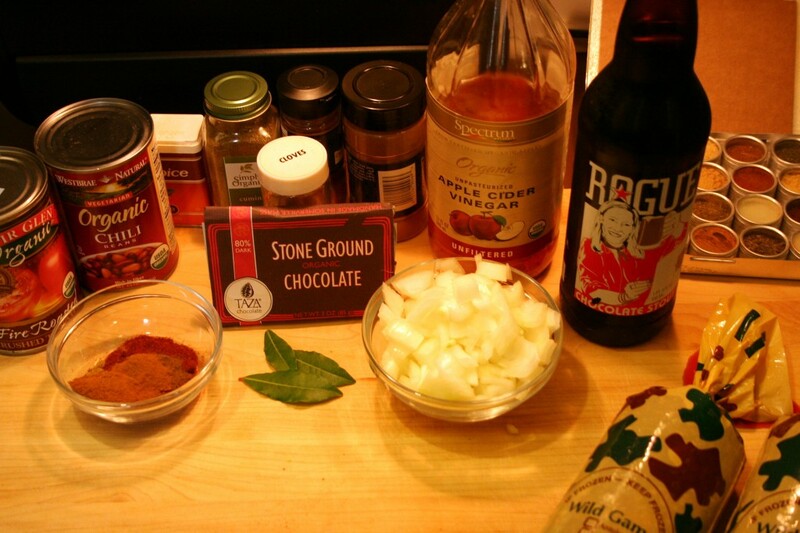 The foundation for this particular chili is the Cincinnati style. That means there is chocolate and spices more typical of a mole sauce. It’s one of my favorites to make because the depth of flavor is so good and you can tailor the level of heat to your own liking. 1. Heat oil in a large saucepan or dutch oven over medium heat. Add onion and cook, stirring often, until translucent or about 6 mintues. 2. 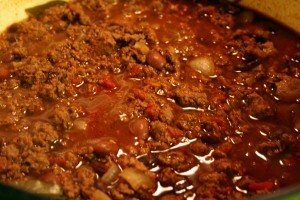 Add ground meat, in batches, if necessary and cook, breaking up with a spoon until all the meat is browned. 3. Add chili powder, cinnamon, cumin, allspice, cloves, bay leaves, red pepper, chocolate, beer, tomatoes, salsa and cider vinegar. Stir to mix well and bring to a boil. 4. Reduce heat to low, cover and simmer 1-1/2 hours, stirring occasionally. 5. Remove the bay leaves and serve as discussed below. 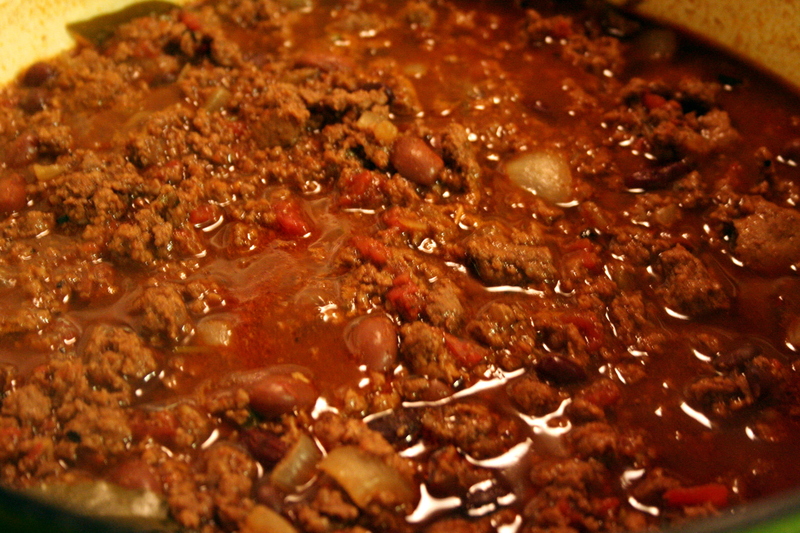 The flavors will continue to build, so this chili improves each day. 1. 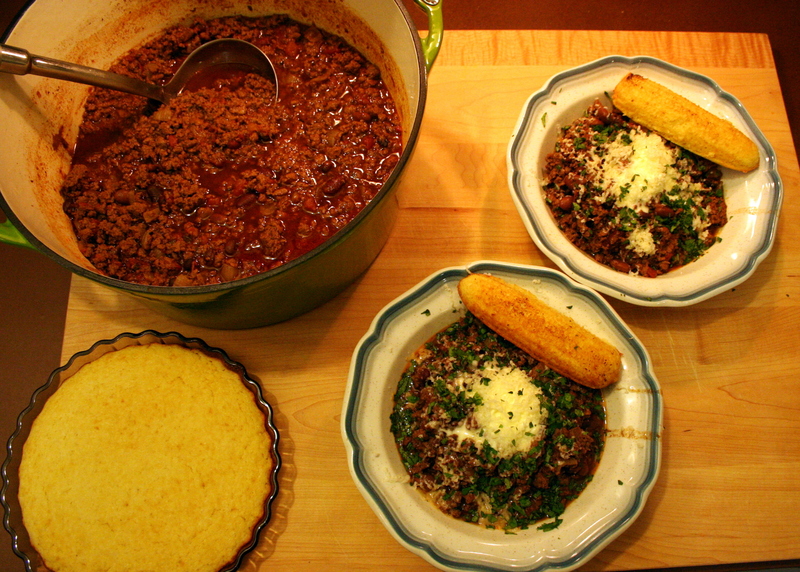 Garnish with fresh cilantro, a dollop of creme fraiche, grated cheddar cheese and chopped raw onion over cheesy cornbread. 2. Garnish with fresh cilantro, grated cheddar cheese, chopped raw onion over spaghetti. 3. Garnish with fresh cilantro, grated cheddar cheese, sliced avocado, creme fraiche over fried polenta. There are many ways to eat this chili and it’s also good by itself but I would encourage you to try it one of the ways mentioned above. 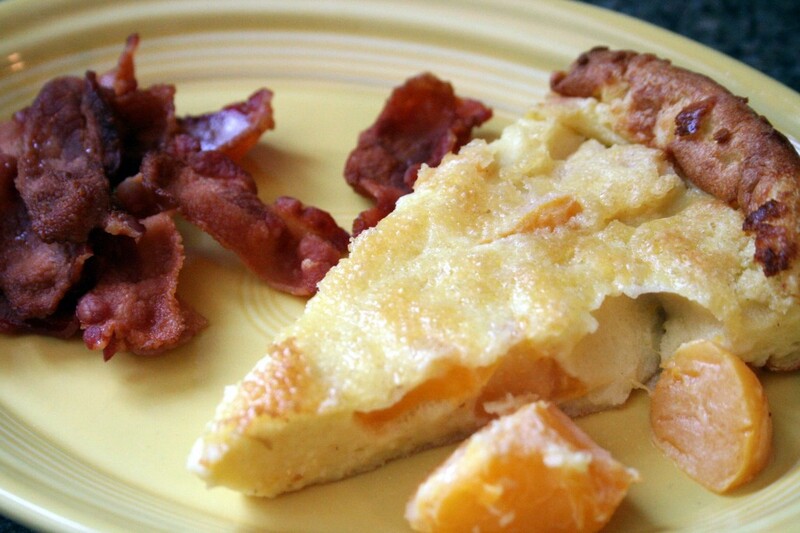 This is a very easy recipe, I adapted it from one my Mother-in-Law gave me. 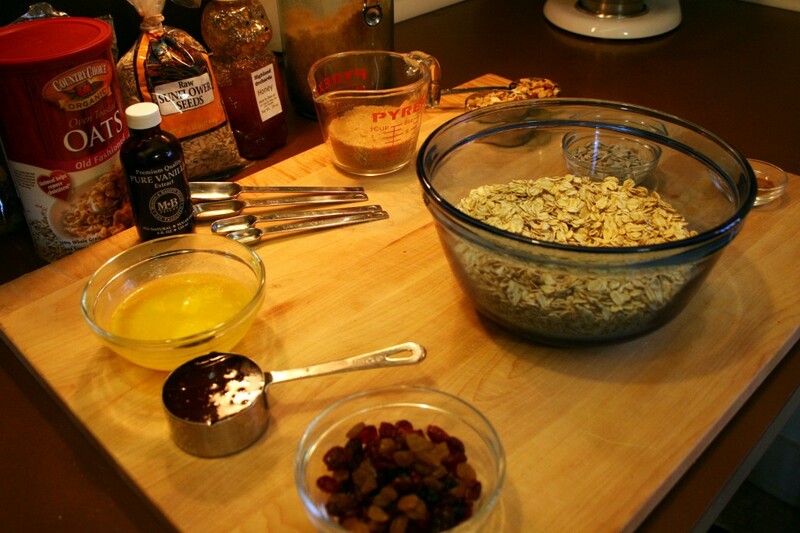 You can get creative and add other ingredients such as flax seed, wheat germ, peanut butter chips or chocolate chips, etc. Preheat oven to 325 degrees. Combine all ingredients EXCEPT the dried fruit. 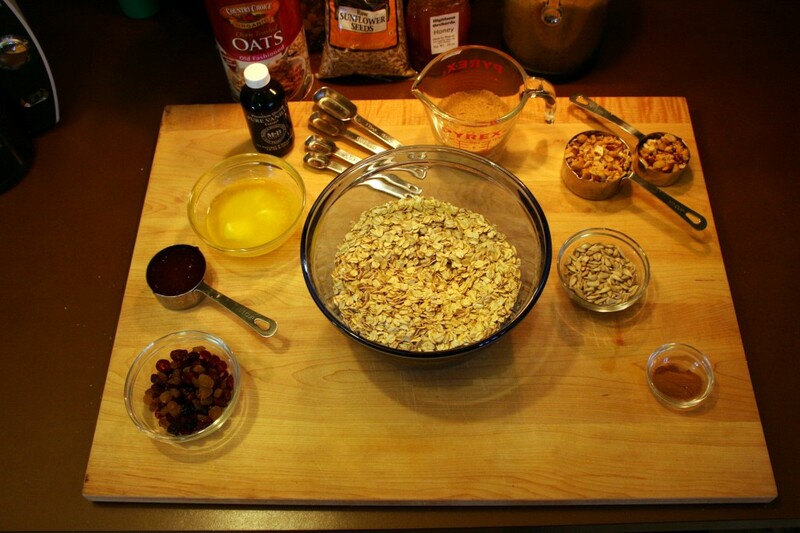 I mix together the dry ingredients in a large bowl first, then add the wet and mix until well combined. 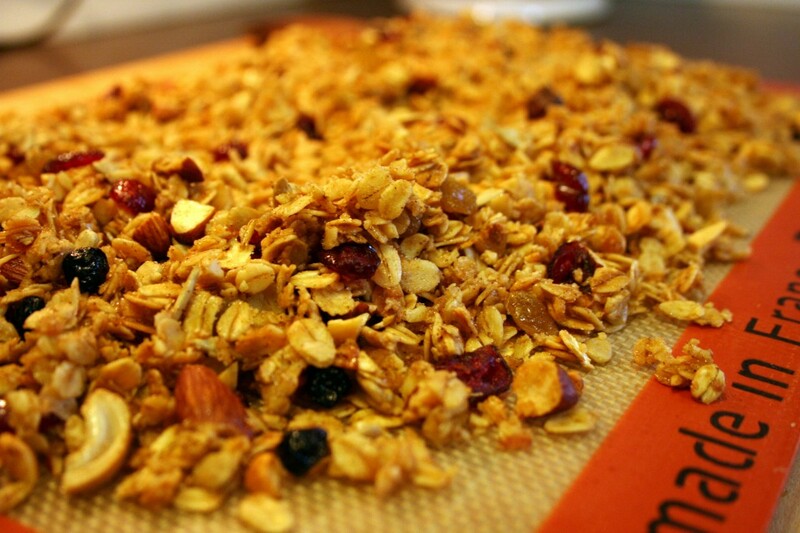 Line a 13″ x 9″ baking pan with a silpat (or lightly grease the pan) and pour the granola mixture into the pan, spreading it out. Bake in the oven for about 25 minutes. Be sure to stir the mixture two or three times while it’s baking. Remove from oven. 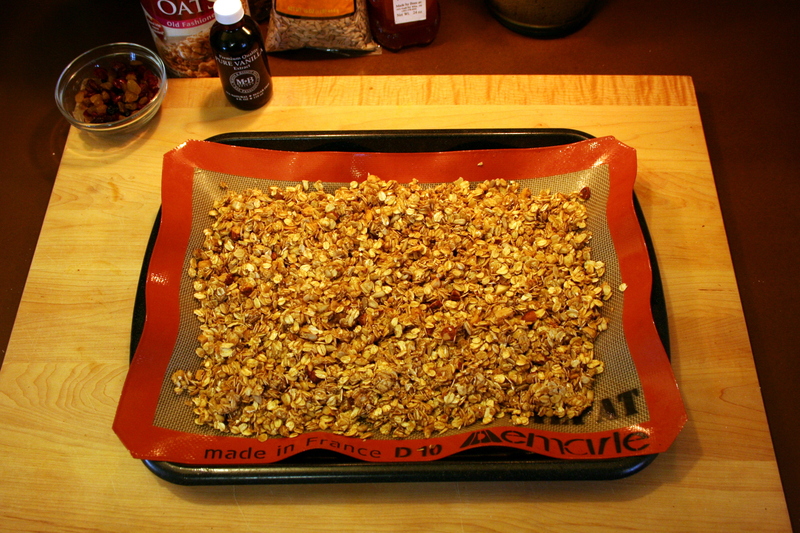 Now add dried fruit (and/or chocolate chips if you are using them), mix and spread out onto a baking sheet to cool. Store in a container in a dry place or in the refrigerator. Fall is definitely at it’s peak in my garden. 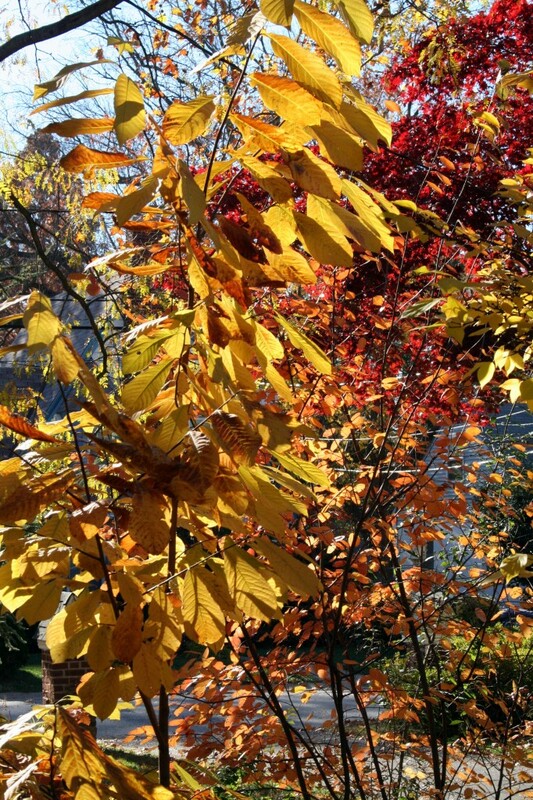 There is an abundance of gold, orange and crimson throughout my small property. I am obsessed with plants and try to squeeze in as many as possible. Each year I’m ripping out more lawn so that I can plant more and more shrubs, perennials and small trees. 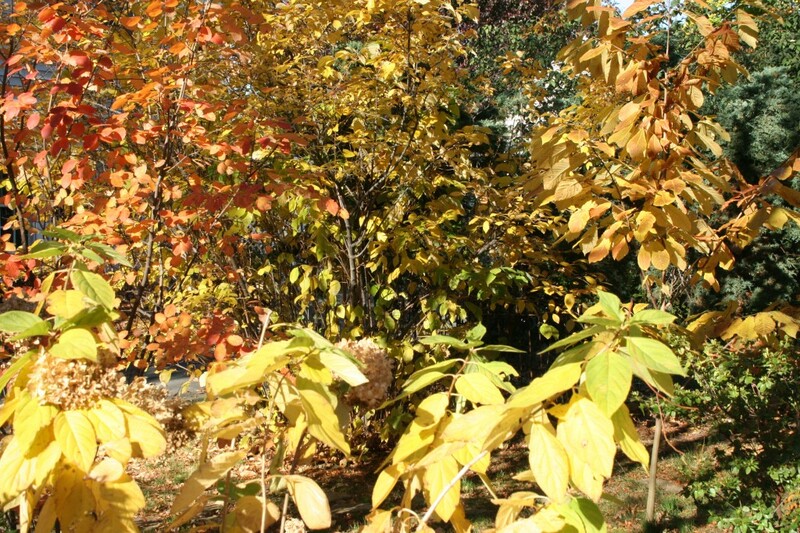 Some of the plants I choose are planted in memory of family, friends or pets who have left this world. 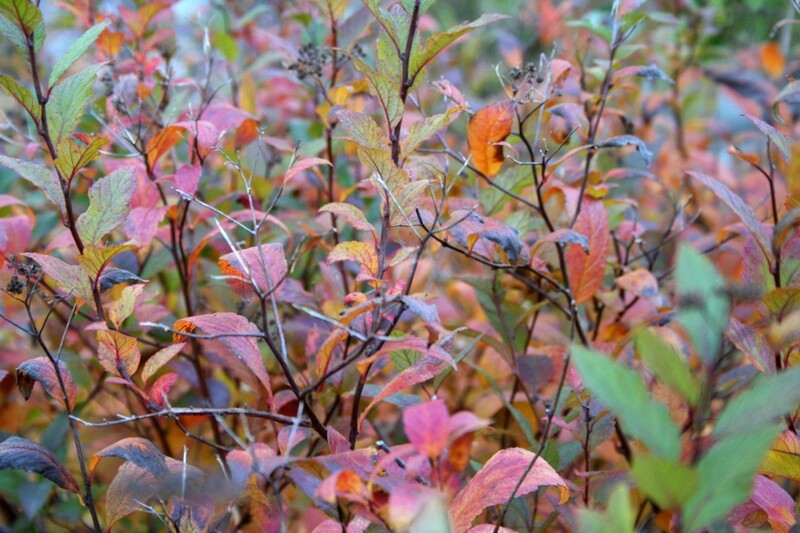 Here’s a few snapshots of fall in my garden this year. 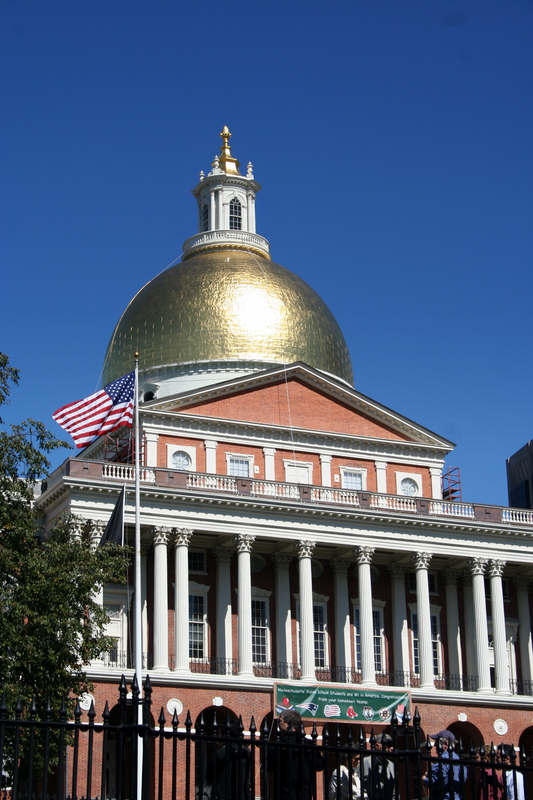 My husband, my mini schnauzer Wolfie and I went up to Boston last weekend. The main reason for going was for my husband and his pal Chris to take part in a fall century bike ride on Sunday. It was a fun weekend and the highlight for me was Saturday. We went into the city on a gorgeous Saturday. 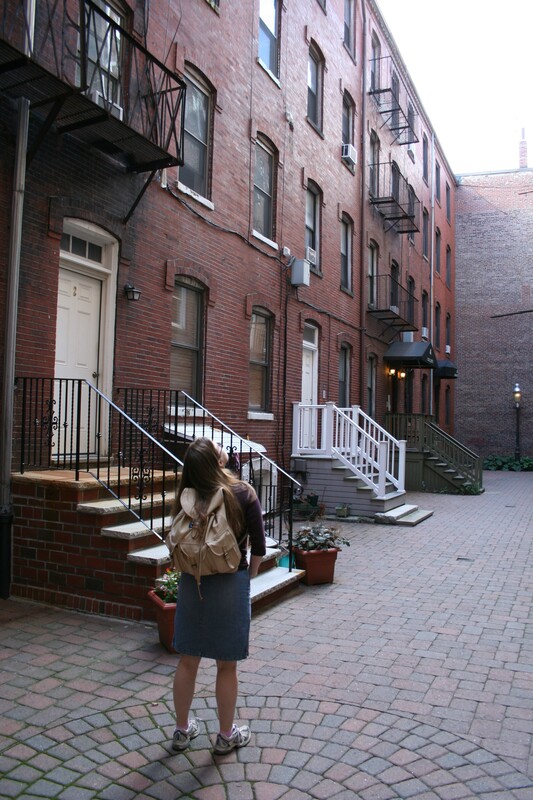 We had fun exploring The North End, or Little Italy as it’s known with our friends. We wondered in and out of specialty food shops, produce shops, stopped for espresso and gelato and really lucked out when we stopped in Monica’s Mercato, where we had to restrain ourselves from buying up every kind of cheese, meat and antipasto they had. 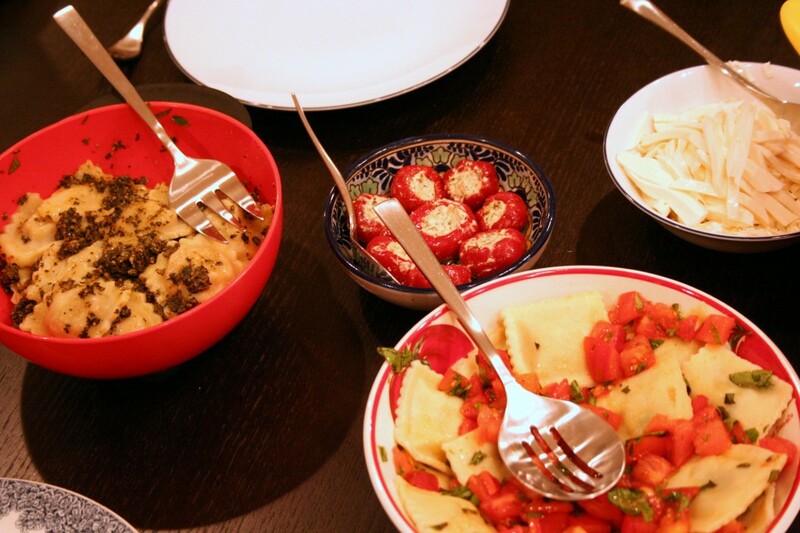 We did leave with some scrumptious homemade ravioli, fresh mozzerrella and parmesan cheeses, cheese stuffed peppadews, herby focaccia and baci for our evening meal that we enjoyed with the DFH beers we brought along. This was a good year for growing butternut squash in my garden. 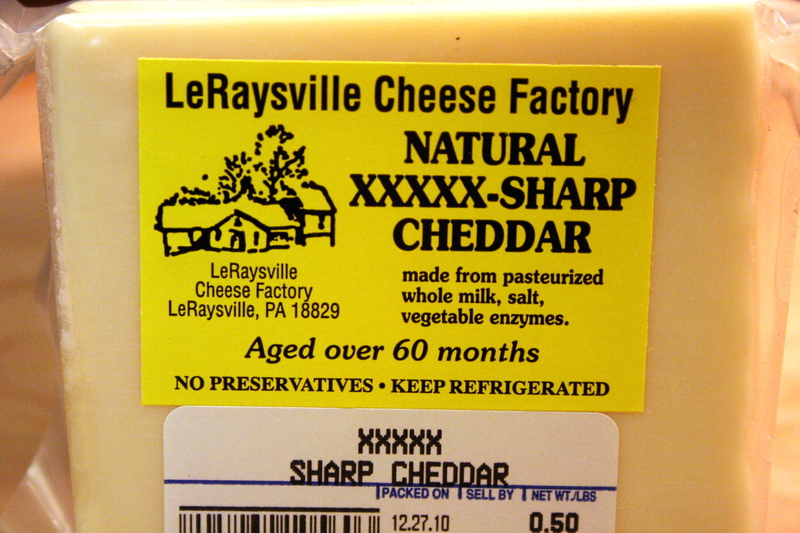 It’s one of my favorites and such a great ingredient for soups and pastas. 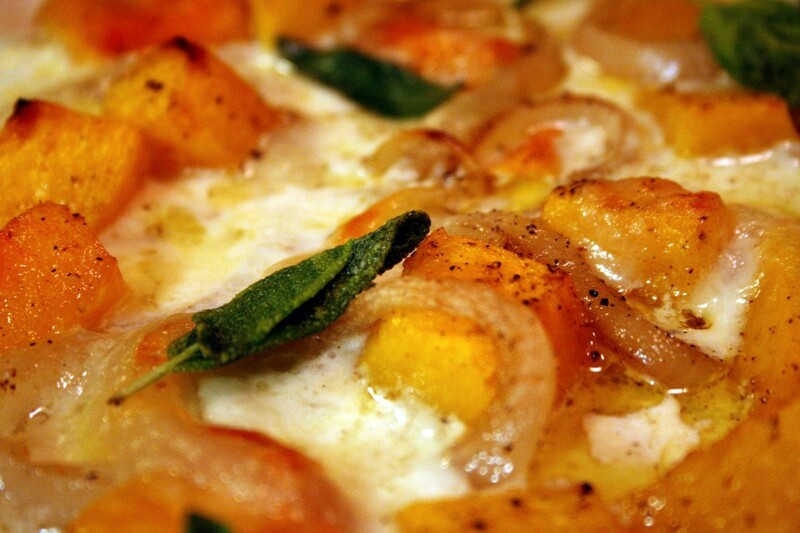 I love a simple side dish of roasted butternut squash. I decided a pizza was the next way to enjoy it and I was very pleased with the outcome. Preheat oven to 350 degrees. Line a jelly roll pan or roasting pan with silpat sheet or foil. Peel and cube the squash into 1 inch cubes. Lay out on roasting pan, slice onion and add to roasting pan. Drizzle squash cubes and onion slices with olive oil, salt, pepper and brown sugar. Place in oven to roast for about 40 minutes. Remove and let cool. Turn on grill and get pizza stone preheating while your roll out pizza dough. Spread thin layer of alfredo sauce on dough. 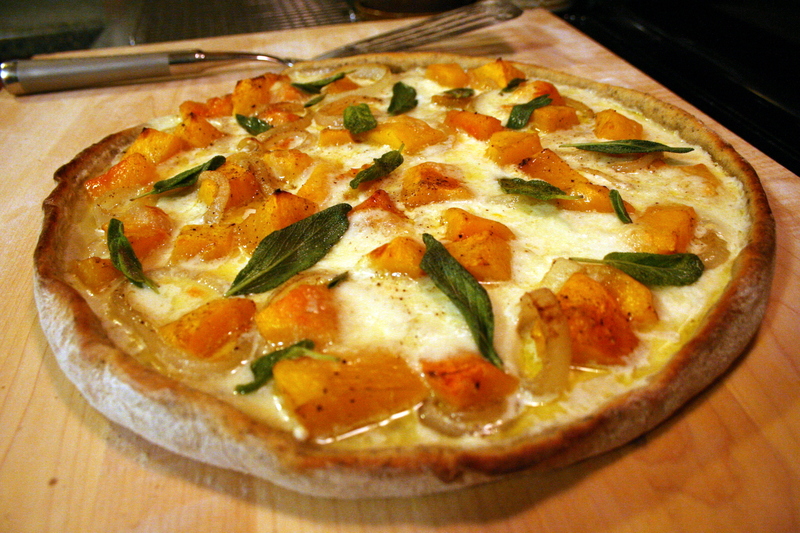 Add cubes of squash and slices of onion to the pizza. Top with blue cheese crumbles and slices of mozzerella cheese. Grill pizza on hot pizza stone for about 10 or so minutes until bubbly hot. 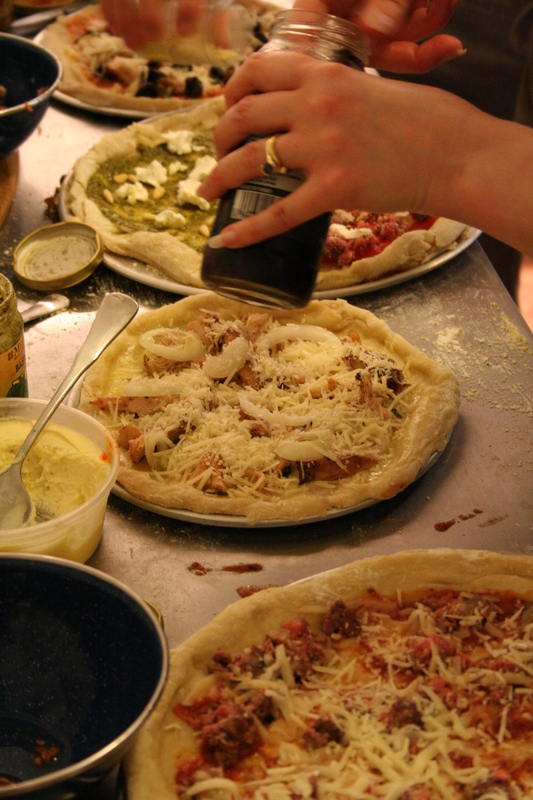 While pizza is grilling heat a pan with some olive oil and carefully fry fresh sage leaves, careful not to burn them. 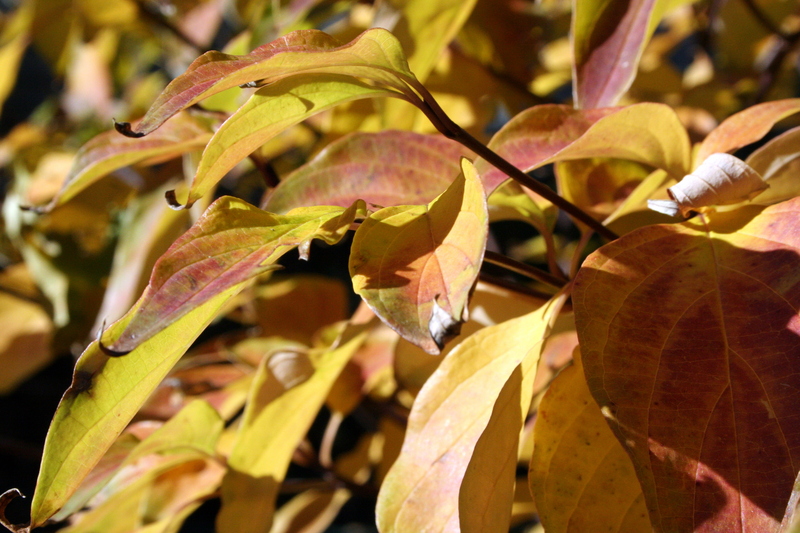 Remove and lay leaves on paper towel to remove excess oil. Remove pizza from grill and top with fried sage leaves prior to slicing.